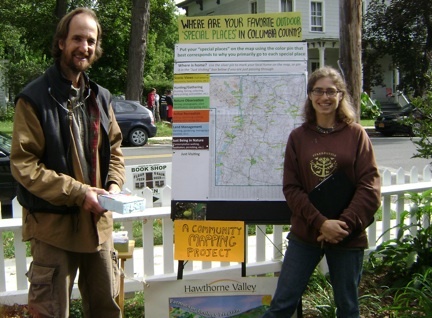 Anna and Conrad gather people's favorite places through our Special Places Participatory Mapping Project - now available as an online interactive map. The work of exploring the biology and culture of our landscape is never finished, and one in which it is always helpful to have the eyes and interest of the wider community. We have a list of ongoing projects in which we are actively seeking your help, whether through the pinning of favorite places onto our interactive map or sharing your land perceptions with us in an interview. We also have a plant and animal observation page, complete with an interactive map, where we welcome your photos and observations of plants and animals that you find interesting, or would like help identifying. Finally, we have our Progress of the Seasons Project, where you can help us gather regional information on natural seasonal happenings.